Cider tea, stirred with a cinnamon stick because i am extra. Another two-fer recipe coming at you today, just in time for New Year's weekend! Judson and I dropped the ball bigtime on making New Year's Eve plans this year (I still blame the fact that we were out of town for the first two weeks of the month), but we've scraped together a plan and will be heading to a pub down the street with friends (the same one where we watched the treacherous election last year), listening to live music and sipping hot boozy bevvies until midnight comes, when we'll all bundle up and walk outside to the golf course that fronts this bar, just in time to watch the fireworks over Edinburgh Castle. The best part? All of this takes place less than 5 minutes' walk from our flat, meaning we don't have to deal with public transit or walking anywhere on New Year's Eve- which is perfect since it snowed all morning today and the forecast is predicting it will freeze overnight and not warm up again until Monday. These recipes, though, are perfect for whatever you have planned between now and New Year's Eve, and will even take you into Dry January with ease. If you're cosying up tonight to stay out of the snow, make yourself a warming cup of cider tea. Heading to a party on Sunday night? Bring along a pitcher of cranberry spice punch (booze on the side), and imbibers and tee-totallers alike will be stoked. cranberry spice punch, after adding wine, next to the soup tureen we use as a punch bowl because we don't own a punch bowl. These recipes come from a AAA pamphlet, better known in the UK, ironically, as AA. ** Because they come from the American Automobile Association, the whole list of recipes is formulated to be alcohol-free so as not to encourage drunk driving. If you're under the weather, driving, acting as the DD or not drinking for any other reason, these punches both stand alone really well. Make them without the optional booze recommendation below and you'll feel better in the morning for it. If you want to get your drink on, though, I've taken the liberty of providing alcohol pairings and recommendations to kick things up a notch. Having tried both of these both with and without alcohol, I can tell you they're both great recipes and I totally recommend them. Happy New Year from the Recipe Box Project kitchen, enjoy your holiday and I can't wait to see you back here in 2018! *Cider Tea is perhaps better called, in UK parlance, Cloudy Apple Tea, as it's not made with hard cider but with the type of apple juice Americans call 'apple cider,' here in the UK known in general as cloudy apple juice. If you can't find cloudy apple/apple cider, regular apple juice will work, too- just up your amount of cinnamon and nutmeg to give it a little extra oomph. 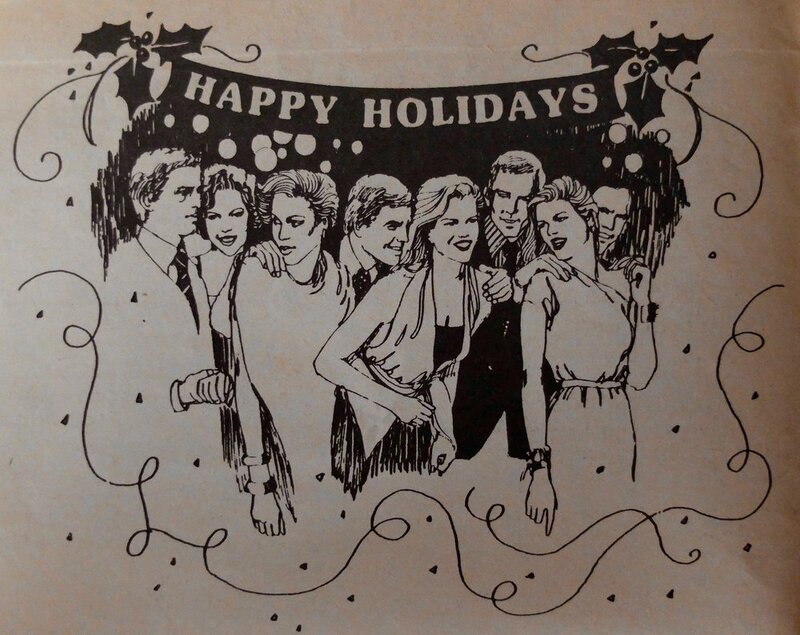 **Also I'd like to point out that this newspaper insert comes from 1985 and the (extremely glamourous) people depicted on it are wishing us all Happy Holidays, not Merry Christmas. Looks like the War on Christmas has been going on a lot longer than Obama's tenure in office, eh? 5 spoons out of five. I made a double batch of this for a party we held recently, and it was gone in a flash. 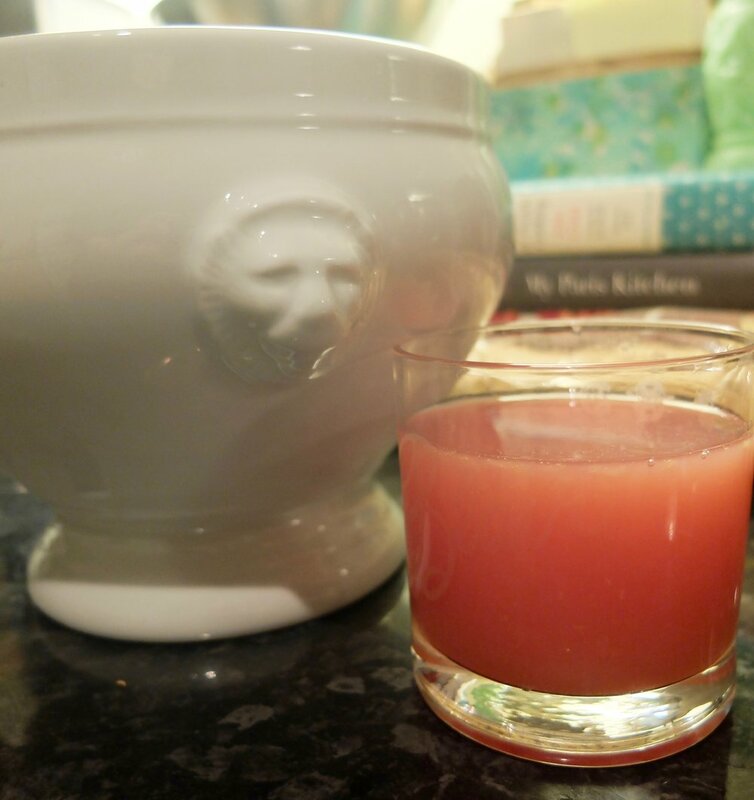 I had to take quite a bit of liberties with the ingredients because frozen concentrated juice doesn't exist in this country or at least at my supermarket, but it was still delicious. I have a sneaking suspicion it would even be good warm, so tell me if you try it that way. Sans alcohol, it was refreshing but still felt seasonally appropriate for winter- a nice change of pace from all the heavy drinks served this time of year (looking at you, egg nog!). 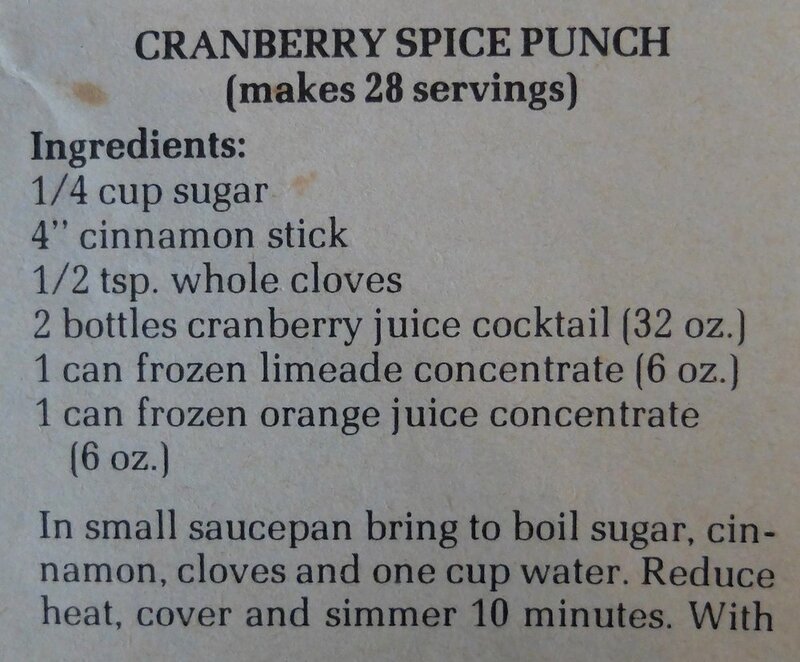 I would have loved the flavour of this as a kid, even as a kid who wasn't a fan of 'punch' in general. With the addition of a bottle of jammy red wine added to it, the colour brightened considerably and the flavour profile became distinctly more adult, with just a hint of bitter to offset the fruitiness. 4 spoons out of five. I want to be clear: I'm only knocking a spoon off of this because even after living in the UK for 4 years, I still don't really like tea (unless I'm hungover). If you like tea, you'll love this- it works well with breakfast tea or ginger tea, and I think it would be good with Earl Grey or lemon tea as well, I just haven't had a chance to try it yet. It's totally scalable and you can easily make as little as one cup or as much as a pitcher. Quantities listed below will make 2 large mugs worth, but double it or quadruple if needed. This one works great if you're hosting a party to have in the crockpot or on the stove simmering so people can help themselves, and it will make your kitchen smell amazing. It's perfect in the morning if you partied a little too hard the night before, or in the evening with a good book snuggled on the couch. And if you add a shot of bourbon or amaretto to it, it's a perfect party drink, too. In a small saucepan, boil water, sugar, cinnamon and cloves. Reduce heat to simmer and allow to cook for 10 minutes until reduced and slightly thick. Remove spices and chill simple syrup until ready to mix the punch. When syrup is chilled, mix with remaining ingredients except the wine. Taste and adjust according to your preference- my preference was a slightly increased amount of lime juice for extra punch, but your taste may vary. If punch is too heavy, add sparkling water to lighten it. If making an alcoholic variant, add in the bottle of red wine, ½ at a time, tasting as you go for strength and flavour. In a small saucepan, boil water, cinnamon stick, orange peel and ½ of a whole nutmeg. When water has come to a rolling boil, remove from heat and add tea bags, then allow to steep without disturbing for approximately 5 minutes. 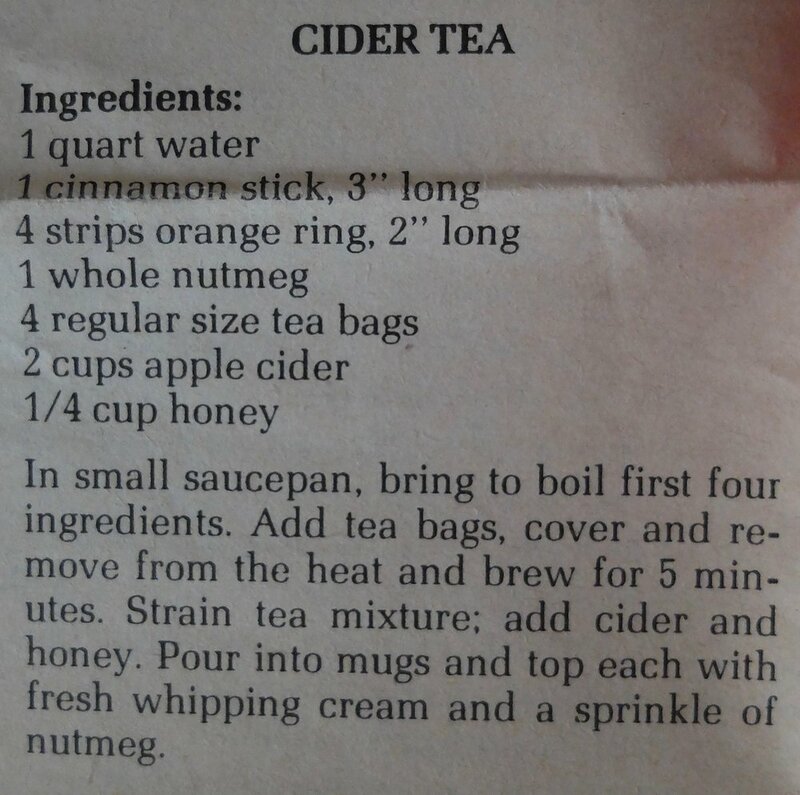 Remove spices and tea bags, then add cider/juice and honey. Reheat to warm and serve sprinkled with additional nutmeg. If making an alcohol version, add 1 oz bourbon or amaretto to each mug (don't add it to the pot if you've made a large batch or you'll cook it out- plus, serving it on the side allows your guests to decide if they want a boozy version or not).